Hi Our names are Danica and Alisha from Kwayhquitlam Middle School. We recently did a Passion Project on recycling and the environment. 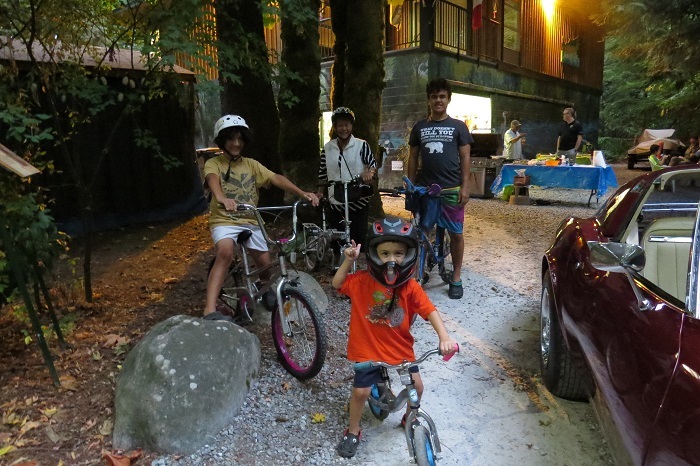 We did a bottle drive in our neighbourhood to raise money for the Hyde Creek Watershed Society. Thank you for the work you do to help the environment and to take care of Hyde Creek. HCWS members thank these two students for their kind donation and their hard work in recycling and taking care of the environment !!! The coho fry in our rearing pond now average 15.4769 gms. Visitor from Australia helped with the weighing accompanied by his great uncle - HCWS member Cameron. Last trays of Coho eggs were shocked. Chum eggs have begun the process of eyeing. In the lower part of the picture there is a school of about 200 coho smolts and right beside them in the middle of the picture is a school of about 24 16 - 18 inch cutthroat. Also observed was a lone coho spawner. Thanks to Mitch for the spotting! Flag pole repair by Shane, Auni, Vlad, Ed and Andy. December 8th, HCWS Members and Drifters Rod & Reel Club, shared a Christmas Pot Luck dinner. Last Coho Brood Stock take of the season. One coho spawner was an ocean coloured silver. Eggs are collected and placed into heath trays for incubation. Helen organized and participated in this survey which took place over 5 weeks. Thank you to Terry, Auni, Duncan and Shane (and pitch hitting from Mitch and Susan for one week) for their participation in observing chum and coho in various stretches of Hyde Creek. Subsequent year data will be necessary to collect to ensure that our data is accurate and has integrity. Photo shows coho & chum in Hyde Creek pool in November. Fry Sampling – will be planned for this coming Spring. Salmon Brookstock Three female coho, and 3 male coho. 3 female chum and 2 male chum. One female chum was ready and 3,189 eggs were taken for incubation. Thank you to all our volunteers who came to help out with this on the weekend! Thank you to the cubs who came out to mark some storm drains! Three Hatchery Managers from China visited our facility. They spent the morning observing how our hatchery operates, and also viewed out education setting. Thank you to Matt Foy, retired DFO Biologist, who organized this, and to Scott Ducharme and Sandra Hollick-Kenyon of DFO who also attended. 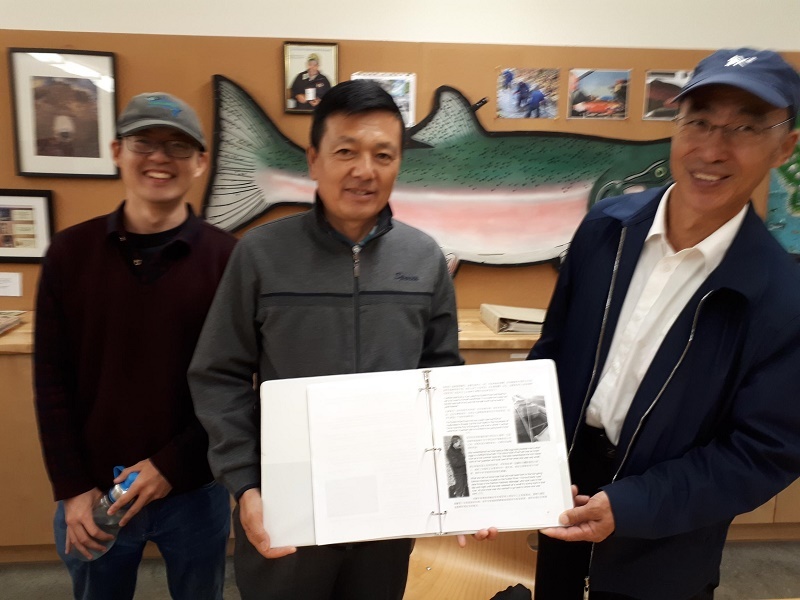 Chia Salmon Ngo has sponsored this trip for these hatchery managers to expose them to Canada Salmonid enhancement techniques and organizations. Left- Managers and translator viewing our educational classroom and outside murals. 1: Managers are viewing one of Matt’s Stories About Salmon People.. See our home page note on International Year of the Salmon. This link will take you to the stories. Story 9 Black Dragon Salmon is the one they are reviewing as it is in their region. Thanks to the beavers that came out to mark local storm drains! Creek pump installed on Saturday by Shane, Terry and Helen. Heavy rains and possible land disturbance added extra turbidity to the creek. Fortunately this cleared by mid afternoon. Thanks to the members and guests who came out to assist. Coho fry weight average is 7.8grams. 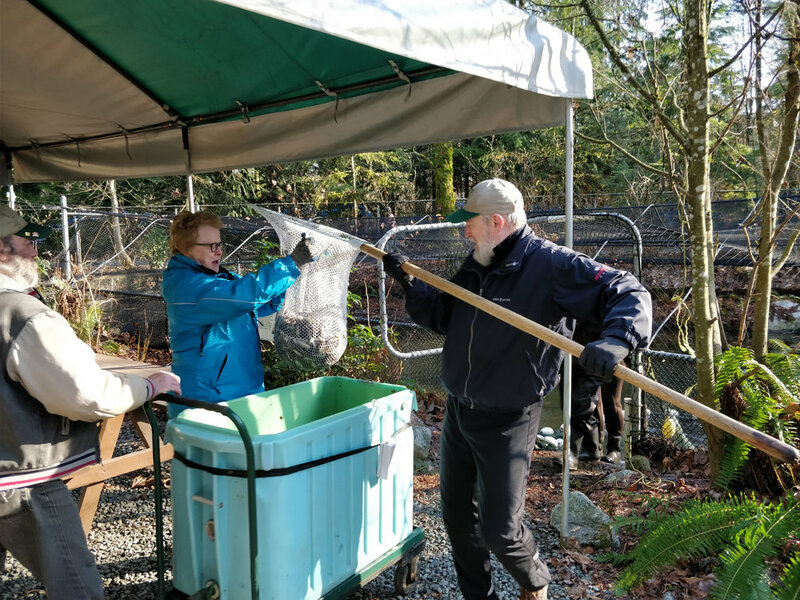 Members rescued salmon fry, trout and Lampray eels from Hyde Creek pond. City of Port Coquitlam removes excess sand from this vital pool. The fish were relocated to a pool downstream. TriCities Church group worked with members Susan & Terry placing fish reminders on storm drains in Birchland area. Over 30 years ago a backyard salmon project began, evolving into the Hyde Creek Stream-keepers. 2018 Hyde Creek Watershed Society celebrates its 17 Years as a Society. Thanks to Joon for culinary BBQ Pork, and to members & guests for their side dish contributions. A mini car show as members & guests arrived after Poco Car Show Parade. HCWS joins with the Great Canadian Shoreline Cleanup. Volunteer visitors and members worked Sat. morning and collected 70 lbs of garbage along Hyde Creek Trails and in the creek bed. Kudos to our visitors who participated & to Starbucks on Prairie who donated wonderful coffee. 1st Fish Weigh for our ponded coho fry averaging 4.6089 grams. Note Shane's swamped waders while netting the coho fry. Brent landscaping. Wonderful evening full of food and friends. Thank you to everyone who made this a great event! Wally, Vlad, Shane and Terry cleaned the aeration tower tanks. Brent was busy clearing out our front walkway. Wally hanging bags of barley into the rearing pond. This will help to lower algae levels which deplete pond oxygen. Clipped Coho fry were moved from the indoor trough tanks, outside to the rearing pond. Dam at the end of the pond was reinstalled, bubbler system in place and fry were transferred. Thanks to members who helped with the move. The last of the unclipped Coho fry were moved to 3 locations in upper Hyde Creek area. The average weight of the fry was 2.686 grams. The coho fry in our trough tanks had their adipose fin clipped to identify them as hatchery fish. Two 3 1/2 hour shifts were covered by members some working both shifts for a total of 24 members. Thanks to Tyler of DFO for training and helping. Mitch and Ho Joon clipped the most fry !! Thank you to all who came out. Big thank you to member Danny Brolese who donated pizza dinner to the members. Visitors from Astoria in Port Coquitlam observed the fin clipping and toured the hatchery. Thank you Poco for your help!! The Coho smolts have gone and the pond needs its annual clean out. Rescue the smolts who didn't get captured in the netting. Pumps working, pressure washers cleaning and the pond sludge is ready to be vacuumed out by the City of Poco's truck. About 1/2 of the Coho Fry, incubated from eggs of 2017 Fall egg take, have been released into the surrounding watersheds. The remaining Coho will be clipped and will grow safely in our rearing pond until May of 2019 when they will be released as Smolts. Remainder of smolts moved to DeBouville Slough by members. 8 members of RBC Bank came out to help us move Coho Smolts from the rearing pond to the DeBouville Slough. Big thank you to RBC. Good weather and our own HCWS Teddy Bear made for a great event. Thanks to everyone who came out and joined in. Member Helen initiated a sampling report of fish in our local watersheds creeks. Duncan, Mitch and Shane worked with Helen on placement and retrieval of the traps. This information will form the baseline data for future trapping and reference. Fish weigh of the coho smolts which will be released into the creek and river system mid-June. The Smolts are averaging 13.63 grams. A preschool class from Kiddies Corner came for a tour and a visit to our hatchery and creek. They discovered cigarette butts, plastic bottles, cans, pizza box, sweater, fish net, plastic cups straws, lots of paper and more plastic cups and pieces in the creek and at the sides. The children’s parents agreed to shorten their tour time and pitch in to help load out the trash. This particular spot has recently been damaged and littered by people hanging out here during the day. Our Society would like to thank all the trail walkers of Hyde Creek who carry along garbage pickers and bags and help keep our trails clean. We would also like to thank the helpful students and young people who, working on their own, pick up many items along the creek edges. Today we’d especially like to thank the 3-5 year olds. Members joined in the Port Coquitlam parade with our float and also our new fish transport trailer and tank. Bill (photo below) was instrumental in designing and building our Hatchery Float. Members Anne, Wally and Vicki taking a break from outside cleanup, Andy, Duncan, Mitch & Auni working on our new tent, 4 visitors from Norway toured our hatchery, and members also worked on setting up the HCWS May Day float. Thank you to John Sherry and Dennis retired BC Hydro employees for delivering a donation cheque, in memory of member Clara Brolese. With the release of all the Chum fry into Hyde Creek, their tank has been cleaned and refilled. Coho fry were moved into the 3 tanks. Shane, Duncan, Mitch, Paula, Auni, Ho-Joon. Releasing some chum fry on a gorgeous day. Thanks to all our volunteers to came to help out! Ho-Joon and Annie. Annual HCWS Open House. Crafts, fish and fun! Terry winning the Port Coquitlam Environmental Award on April 20th. Thank you Terry for all your hard work! Children up to 5 or 6 years old attend with their parents to focus on community support and activities. Member Mitch found a 2 headed Coho fry. Approximately 300 Coho have grown big and are almost the same size as fish in hatchery pond now. There's also about a dozen 10-12 inch cutthroat trout swimming amongst them. Chum eggs have started to hatch, and are now reaching the next part of their lives as alevin. These little guys are newly spawned salmon, which still carry the yoke on them for feeding. Coho egg shocking is now all done. This is the process where Coho eggs are dropped into another container, agitating them just enough to turn infertile eggs white, separating them from the rest of the batch. Lastly, pond fish were weighed on Saturday, they average 11.1 grams and are now 13 months old. Mitch collecting fry. New trailer delivered by Mitch and Ed on January 3rd. Gert, Ed, Mitch and others placed the tank onto the trailer on Sat. Jan 6 and the installation and hook up work began. Big tank you to Gert who cleaned off the older decals and polished up the fish transport tank. Inspectors, Larry, Helen & Shane assisting Gert. Thank you to some kind elves (or salmon) who decorated a tree outside the hatchery. Due to low water levels in creek members netted Chum and Coho at the pump station pool on Cedar Drive. Then the fish have to be trucked back to the hatchery. Rains have since arrived and water levels are returning more to normal. Members Shane, Duncan and Brad and others were there to help. Thanks to all the volunteers that helped with the fish take today. Made the day a success! Thanks to Gert, Terry, Mitch and Helen for removing a dam of large logs, branches and more. Big thank you them for hours spent cutting and and removing. Resulting in passage for salmon in Hyde Creek. Mitch, Terry and Duncan working at culvert entrance. Without volunteers, our salmon wouldn't have such a great habitat! Thanks to everyone who helped with the culvert. Duncan, Shane and Gert working at culvert. Chum salmon are in lower Hyde Creek waiting for rains and higher water. Large pool is a resting place for the spawning coho and chum salmon who will continue their journey through the culvert and up to the higher areas of the Hyde Creek watershed to spawn. 12 volunteers came out to work on a stream monitoring project for the Pacific Salmon Comission doing invertebrate sampling workshops. They were looking for a space to bring samples and use their microscopes for identification. HCWS was happy to accomodate them with our classroom space. Thank you to Gert for being the liaison with the group. The City repaired the culvert going under Coast Meridian Road. Our water intake system was removed for the repairs, and replace on Sept 23 by our members. (left) Great turn out of volunteers help with coho fish fish weigh. Mic works on the water system oxygen and water flow equipment. Scout group with members Susan and Terry marked storm drains in Coquitlam. More clean up uncovered an item which appears to be a partial display system. Bruno, Carol, Linda & Marianne set up our display at Port Coquitlam's Canada 150 Celebration at Lion's Park. Bicycle visitors tour the hatchery. New Work Bench completed. Thanks Andy. Fish fence to keep fry back from creek pond during culvert work and pond clean out. Scott, Community Advisor and Tyler, Technician install new chiller and uv equipment. Thanks to Ed, Ray and Larry for working at the BBQ and officially cutting the cake! Evening was a lot of fun, great company & the food was terrific. Congratulations to Scott Ducharme of DFO in his new position as Community Advisor. Maurice Coulter-Boisvert retired in June. Welcome to our new DFO Technician, Tyler Thibault. Fish weigh took place with Tyler in attendance. Average weight of our Coho fry in our rearing pond is 5.688gms. Summer creek work removing snags and debris in Hyde Creek. Dams can form during storms and block access to spawning beds. Brad, Bruno, Ed, Vlad, Terry, Mitch, Gert (and Shane) cleared a number of spots along Hyde Creek. Before & after photos of one larger clear out. Donated tools and equipment from member Marion Patterson are being sorted by Gert, Bruno and other members. Andy is building a new work bench for the new items and is helped by Vlad. Creek pump water intake pipe was given a cleaning and overhaul by Ray. Landscaping of our site is underway big time. Thanks to Brent. Fish Transport Tank (new to us) now on site. Thanks Mitch, Ray, Terry, Vlad and Shane for transporting and unloading of tank. Yearly testing of emergency water supply by Shane, Ray, Carol, Mitch & Helen. Repair of pump at the work bench, by Gert & Shane. Many other projects underway! Minnekada Summer students visited our Education Centre. They are attending food prep and cooking classes with Adam Jonas. 24 members and guests came out for a fun social evening. Many interesting and scrumptious dinner plates to choose from. Great July weather! 11,000 Coho fry were clipped by members and Mayors and Councillors of Port Coquitlam and Coquitlam. The fry are clipped for DFO data and sport fishing identification. Mitch was the top clipper of the day. Members attended an afternoon event of networking, viewing displays and a wonderful slide show of volunteer work done in Coquitlam. Although our Education Centre & Hatchery is located in Port Coquitlam we work within the Hyde Creek Watershed which includes Coquitlam. Tours & classes at our facility are attended by SD 43 students along with other schools and private groups. Work continues thanks to the many talents of our members and the funding from Coquitlam. Safe travels to member Bent, who is on a North American adventure. A new net was installed over the new wiring. (Right) members helping with installation of new netting. (middle-down) The little girl picked up most of the float metallic paper that got left on the ground. She’s the niece of members Melissa and granddaughter of Dave. 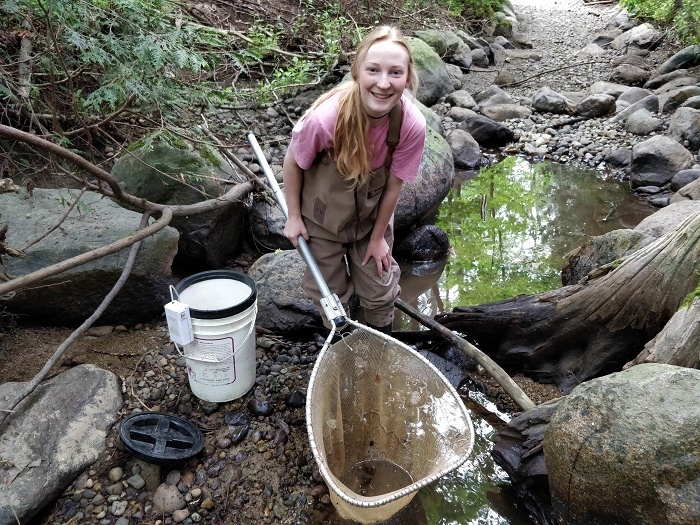 Evening releases of the Coho Fry were done on June 9 into Partington Creek, June 13 into Hyde and Smiling Creeks and June 14th into Cedar and Watkins Creeks. 4 new visitors joined our members. Interested residents watched and asked many questions. A few curious children were keen to see the fry in the travel tank. RBC Help with Smolt Release. Thanks to Serena, George and Jen for helping us move salmon smolts from the rearing pond to mouth of Hyde Creek. Due to summer drying sections of the creek in recent years, smolts are not released at the hatchery. New cables installed and old netting removed. Thanks to members and Coquitlam grant. Members attended the weekend conference and networked with many hatchery groups and other "fishy folk". Workshops were excellent and much information was collected. A side trip to Bakerville on Sunday. The day began with showers. By parade time the sun was shining and another great event. Thank you to the members and students who came out to set up and walk in the parade. Thank you to the City of Coquitlam for their generous funding to allow us to purchase predator netting and cabling, pond aerator, pond recirculation pump, cyclone filter, 1hp chiller, uv sterilizer and canopy for outdoor class. The project is underway and members are currently replacing cables. April 22nd 2017 - Open House & Salmon Release - see Salmon Release page for photos. 7000 Chum Fry release by the Grade 4/5 students from Central School (Mr. Huston and Mr. Exley's classes) who came out for a tour and volunteered to move the chum from our trough tanks into Hyde Creek. Congratulations for a job well done. Second fish weigh of Coho in pond. Average weight of 17.92 grams. Saturday visitors help feed the "new" coho who are weighing in at 0.7123 grams. Members "ponded" chum salmon from the hatchery egg room into the trough tank. It's a slow process as the salmon move from their incubation tray. Lots of rain in March and creek work is necessary. (Left) Mitch and Gert replacing sand bags. Maurice Coulter-Boisvert, DFO Community Advisor, retirement. Maurice was with DFO for 38 years, and was an integral part in assisting us as Hyde Creek Streamkeepers and then as Hyde Creek Watershed Society. We're all hoping Maurice will find time in his retirement to keep an eye on our hatchery. Members weighed coho from the pond. Average weight of fish is 15.402 grams. In the egg room the Chum and Coho eggs continue to grow. Thanks to all the members who monitor the egg process. Bent Pedersen, Mitch Rasche, Mick Hunt, Ray Melville, Tara McBryan, Ian Barrie, Ed Beye, Paula Soto, Bill Christie, Doris Wilcox. January 7th 2017 - To wind up 2016 members were busy chasing an interloper mallard from our pond. Twice he managed to sneak in. More netting repairs solved the problem. Long time member, Garry Tite passed away Oct 8. 2014 Members will miss him, and send condolences to wife Lynn, and son Troy who are also HCWS members. Members mourn the loss of our Hatchery Manager, Nigel who passed away at the end of August. He will be greatly missed.